John (Johnny Cougar, John Cougar, John Cougar Mellencamp... whatever he's going by these days) Mellencamp was right when he sang that America is something to see. We've got something for everyone: karaoke songs for the Japanese, disaster recovery for Mexican "migrant workers", democracy for the assorted villainous dictatorships, and factory jobs for people in whichever country can lower their standards fast enough. Apparently, what we've got for Israel is chocolate chip cookies. While having a quick lunch at the local kosher deli before hopping my flight to Brooklyn "Ir HaKodesh" (the Holy City), I looked around to see if there were any snacks I might like to take on the plane. My favorite airline (or should I say "jetline"?) recently stopped giving the snack that lured me to using them, so I thought I might supplement the emptiness with something. As I am a very picky eater, I have to be careful when buying things that I've never eaten before. 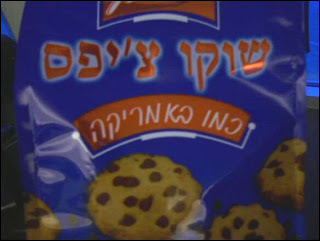 After grabbing a few things, my eyes made their way to a bag of chocolate chip cookies with only Hebrew writing. 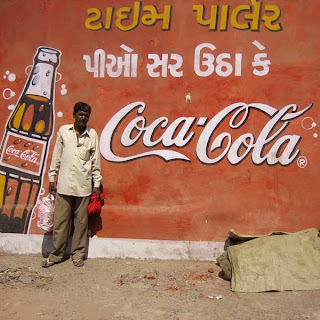 The writing said "kmo b'amerika" (like in America), so I thought, "Sounds safe enough to me". While waiting in the terminal to board my flight, I opened the bag of cookies. As I put the first cookie into my mouth, the initial shock of extreme hardness subsided as the cookie turned to sawdust with the first bite. "Is this what Israelis think American cookies taste like?!?!" I wondered, as I quickly tossed the bag into the trash. Like someone with memory loss, I failed to remember a vital lesson: the remake is rarely as good as the original, if the original is even any good in the first place. This tiny experience made me think about how representative it is of all American exports. We are quick to give work to "migrant workers" that flood communities after disasters, but how many Americans do we have sitting at home without jobs? As far as exporting democracy, do I even have to write about the outcomes? Not only have we failed to understand what it takes to create a stable democracy (Hello, middle class anyone? ), but we have become so self-righteous that we ignore our own past and criticize others. The late, great Kurt Vonnegut said it best when he explained the lesson he wanted to give Iraq about democracy. "... after a hundred years, you have to let your slaves go. And, after a hundred and fifty years, you have to let your women vote. And, at the beginning, quite a bit of genocide and ethnic cleansing is quite okay, and that's what's going on now." Said mockingly, Vonnegut's words are sadly true. From the period of our country's stance of isolationism, we have become the exporters of everything hip and trendy, but people on both sides rarely see the underlying results of what we give them. Southeast Asian countries would rather have American factories destroy their entire domestic wildlife and landscape than see a factory built in another country. Well, I suppose local people will need that 10¢ an hour to buy food once the pollution kills off local vegetation (let's forget "cause and effect", because it seems most people have). I will, however, offer a warning to these consumers who are new to the global market: when you start seeing the "Vietnamese noodles with fresh vegetables" packages in your (recently) local grocer's freezer, and you take them home to heat them up in your (newly needed) microwave, remember that the remake is never as good as the original. The remake is never better than the original.